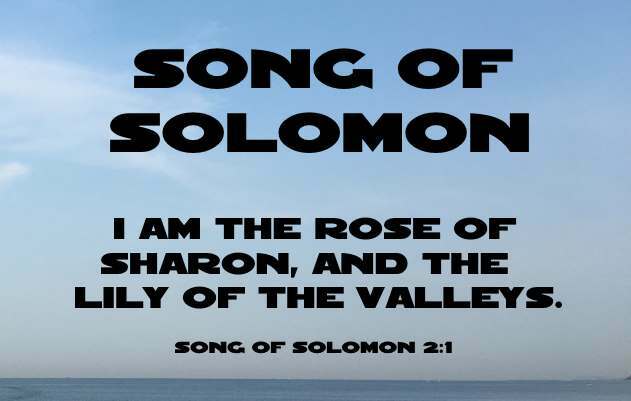 This description of Song of Solomon is from Easton's Bible Study. "Solomon, Song of: called also, after the Vulgate, the "Canticles." It is the "song of songs" (Song of Sol.1:1), as being the finest and most precious of its kind; the noblest song, "das Hohelied," as Luther calls it. The Solomonic authorship of this book has been called in question, but evidences, both internal and external, fairly establish the traditional view that it is the product of Solomon's pen. It is an allegorical poem setting forth the mutual love of Christ and the Church, under the emblem of the bridegroom and the bride. (Compare Matthew 9:15; John 3:29; Ephesians 5:23,27,29; Revelation 19:7-9, 21:2,9, 22:17. Compare also Psalm 45:1-17; Isaiah 54:4-6; 62:4,5; Jeremiah 2:2; 3:1,20; Ezekiel 16:1-61; Hosea 2:16,19,20)"